Baum Corretto Review - LA VELOCITA. 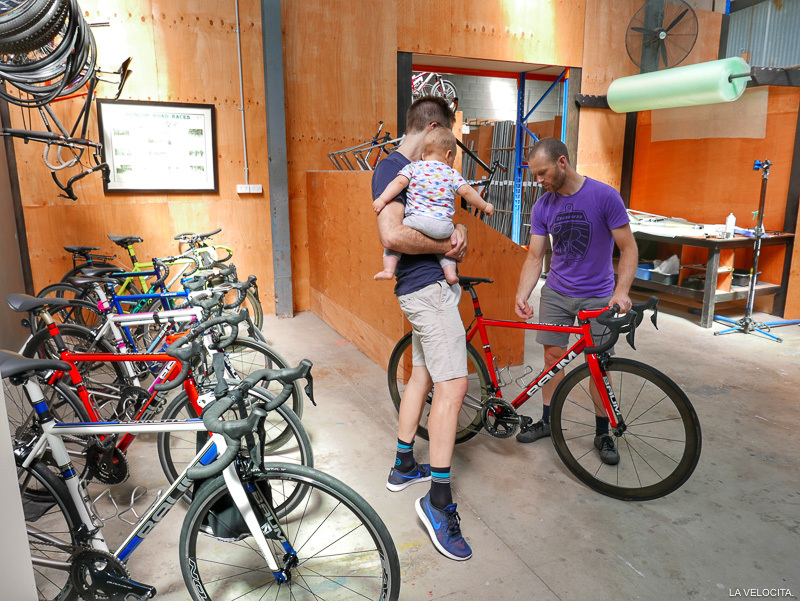 What's it like to ride a frame by the legendary Australian builder? Darren Baum has gained a reputation as one of the master craftsman of bikes. He and his team create beautiful machines, hand-built and measured for each individual that is lucky enough to get the opportunity to own one. I picked up my own Coretto late last year and I thought I’d share the ride. Where to start? I’ll be honest, I found it a little intimidating at first, they are seriously pricey and some may view owners as people who fall into the ‘all the gear, no idea’ category. So when I threw the leg over for the first time I felt a little like I needed to back up the bike with a corresponding performance from my legs… However, I need not fear, people love seeing the Corretto, asking me questions about it, and generally making "oohing" noises. The Corretto is Baum’s ‘racers' bike. Titanium with a carbon fork, rim braked, light, nimble and fast fast fast. Well that’s mine. As you go through the four hour fitting and design process with Baum, you get the opportunity to customise not just the fit, but the handling characteristics you’re after. I’ve elected to go for something toward the nimble end of the spectrum, a bike that goes where you point it, that turns in and inspires confidence. A bike that is stiff enough to support my 80kgs but not rattle my teeth out. This is one of the parts of the Baum process that I think separates them from many custom bike builders. Like in any product there’s a range available... there’s custom and then there’s custom… you're probably thinking, 'what on earth are you rubbishing on about…?' Having a bike built is more that just about arm, back and leg length (and the other measurements and angles). It’s about what is comfortable, what feels right and how you want the bike to handle. Broadly, I’d say that there are three levels of custom. One; choosing your paint colours from an available range and a build kit. Two; handing over your height, leg, arm, leg length and sending them off to then be presented with a bike. Three is the full monty, a measure, fit, custom tube construction and paint. When I say Baum does a custom fit, I really mean custom fit. I spent over an hour pedalling away on Baum's fitting jig. There were volleys of questions and incremental adjustments to get everything millimetre perfect. After a shower I sat down for a chat about riding habits and favourite bikes I've ridden in the past. Not only does the bike fit, it rides like you want it to. Baum has gone all the way and I truly believe it’s worth it. I’ve got no plans to ever part with my Corretto, hopefully it will get passed down to my son or daughter one day. On the looks side this Corretto is pretty classic looking. Sittling by itself it does not look like a massive bike. I’m 188cm tall and ride a 58 frame, and some bikes I have reviewed literally look like they could double as a farm gate. The Baum avoids this. It’s lines are close to classic, and the tubes look modern skinny compared to the massive carbon offerings getting around today. All welds on this bike are perfect. Literally perfect, there is no other word, perhaps exquisite would also fit. The paint is also rediculously good. 100% hand painted can sometimes mean not 100% perfect, but I can’t find a floor anywhere. I’ve also pushed the Corretto along plenty of gravel roads (I have to ride a 800m stretch of gravel just to get out of my house) and the multiple stone impacts have not resulted in a single blemish or chip. On the road it’s exactly what I asked for, nimble but not twitchy, stable at speed, turns in well, stiff enough and comfortable enough. The biggest adjustment I’ve had to make post arrival of the Corretto is that that the guys raised my saddle high a massive 7mm while also hitting me up with longer cranks. At first this felt almost ridiculous, but 5 months in it feels great, and when I jumped on an old bike of mine set up to my old fit I literally felt like I was pedalling with my knees coming up to my ears… I’m embarrassed I was riding like that for so many years. Six months in what do I think of this bike… well I love it. I’m glad every time I see it, every time I go for a ride. Yes it cost a lot, yes I had to wait a while, yes it’s a luxury item, but would I do it all again? Yes of course. It’s worth every dollar, in fact I wish that I’d got on the Baum wagon earlier and saved the money on my last two or three carbon bikes that together would have been more than enough for the Baum. You simply can't compare a Baum purchase to buying an off-the-shelf bike. You're paying for more than Ti tubes, welding, and tightening bolts. You're paying for thousands and thousands of hours honing skills to make a phenomenal and unique product. You're paying for bike fitting expertise that gets interpreted into tube lengths, angles, and component choices. Talented frame builders are artisans. Comparing a Baum to mass-made bikes is a false equivalency. People's minds may boggle at the price of a Baum. Not me though, and I suspect other owners will agree. They're worth it. I’ve only got one gripe with Baum…. Guys do something about your water bottles! They are rubbish. I had better bottles from k-mart when I was a kid. Head to Baum’s website to look at the range, we also previewed their new range, the Essence, Code and Orbis a couple of months back…. The Code is on my list as next bike…. Disclaimer - This is not a paid article. I bought my Baum and love it… thanks to Darren, Ryan and all the team that made it happen. Trek's 'endurance fit' design is loaded with features. Will it help you get through a long day in the saddle?